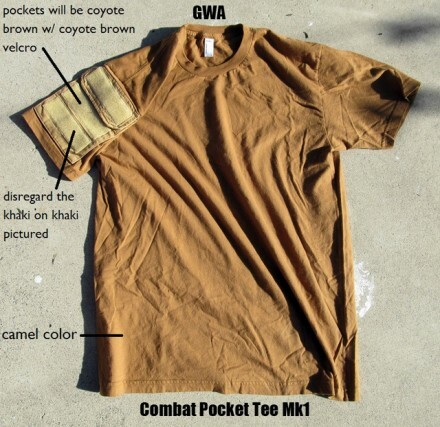 Gear Whore’s Anonymous just closed down preorders for their new Combat Pocket Tee (CPT) Mark I, inspired by the one “Colonel Smith” was wearing in the movie “The A-Team”. GWA, if you weren’t aware of it, is a page for all gear whores everywhere: the obsessed, the addicted and even those in recovery. The images below are roughs made by GWA out of raw materials, so it’s not an exact portrayal. -American Apparel, Made in USA tee in Camel. -2 pockets, 1 on each shoulder. Generous amount of storage. -Left side pocket will have a pen / pencil holder. -Coyote brown velcro on both pockets. Generous amount for patches. Shirts will be $45 including domestic shipping. If you’re international it will cost an additional $15 for Priority Mail. 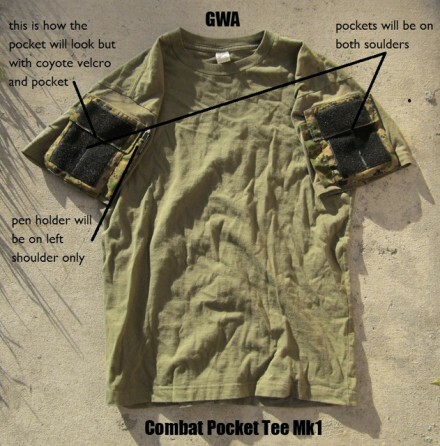 This entry was posted on Thursday, January 5th, 2012 at 11:08	and is filed under Clothing, Military, MilSim, Uncategorized. You can follow any responses to this entry through the RSS 2.0 feed. Both comments and pings are currently closed. A bit like the Tactical Distributors ‘Shooter Shirt’. Which by the way is the most comfortable shirt I own. I’d like to see how the Mk1 works out though. I enjoy being able to rock a morale patch under my ABU’s at work even though I’m not a zipper suited sun god. There’s a old photo of a real operator wearing a OD T-shirt modded with pocket sleeves and velcro panel. This idea pre-dates the lame A-team movie.